Beow Heong Lim Temple (妙香林寺) - When pigs fly. Beow Heong Lim Temple (妙香林寺) at 503 Hill Railway Rd in Penang will be the final resting place for myself and K.K. Allow me to explain why I plan to be cremated, shoved in a yellow jar with red writing and shipped half-way around the world when my time is up... but first, do you know what a columbarium is? Simply explained, it's a series of cubicles measuring approximately one square foot stacked together to form walls where the remains of deceased persons are entombed. In the photo on the right, you'll see someone standing before a metal rolling table with candles, incense, (vegetarian) food and tea praying for a loved one. This is typical for how one would pray for a loved one at Cheng Meng or at the 100th day after death or any other special occasion. Beow Heong Lim Temple is where K.K. 's mother, grandmother and two aunts remains are kept. It's the reason why we travel to Penang for Cheng Meng every April. The upper photo on the right shows the actual tombstone enclosures of K.K. 's aunt (who adopted him when his mother died 30 years ago) as well as his grandmother who passed 5 years ago. You'll notice that K.K. 's name are on both tombstone enclosures. Here are some general photos of Beow Heong Lim Temple on FourSquare. The funeral ceremony, which traditionally lasts over 49 days, the first seven days being the most important. Prayers are said every seven days for 49 days. The number of ceremonies conducted is dependent on the financial situation of the family. The head of the family should also be present for the burial or the cremation. After 100 days a final prayer ceremony is conducted. In the Mahayana tradition of Buddhism (which most Chinese Buddhists subscribe), it is believed that between death and rebirth there is an intermediate period called "Antarabhava". This is an important period which has an influence on the form that the rebirth shall take. If the family ensures that proper assistance in the form of prayer and remembrance ceremonies are duly performed, the departed is better able to take a favourable rebirth. 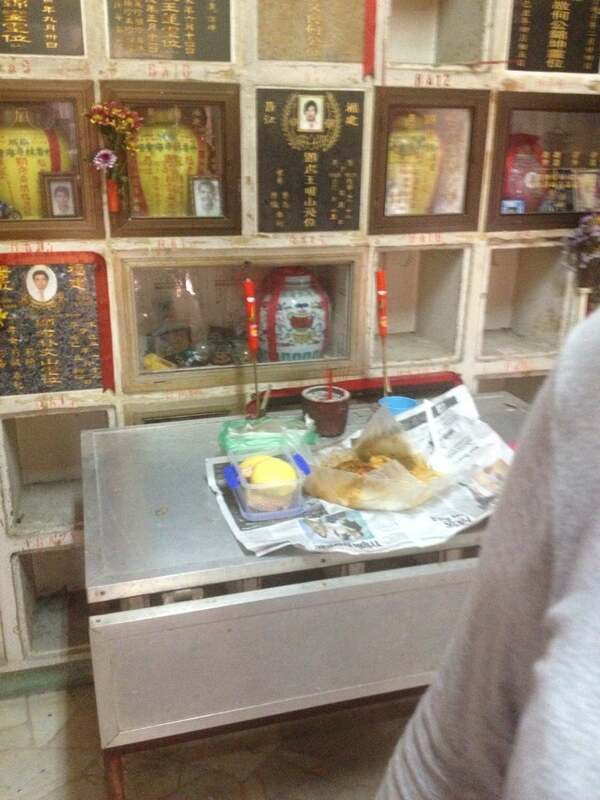 Here is more information about Chinese funeral customs.